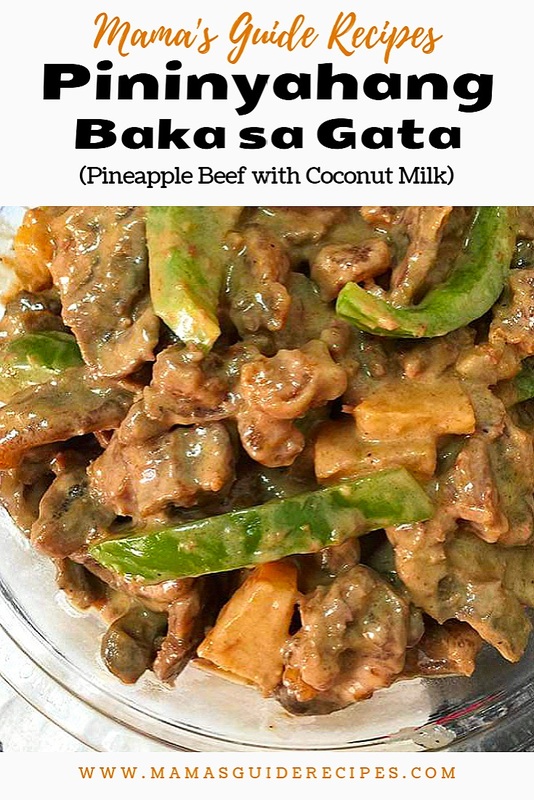 Pininyahangbaka sa gata (Pineapple beef in Coconut milk) is a yummy Filipino beef recipe. It is a tender beef strips stewed in coconut milk sauce with pineapple chunks for that kick of sweetness and seasoned with shrimp paste. Get ready with lots of steamed hot rice! In a pot of water, cook the beef first until it becomes tender for 1 ½ – 2 hours with pepper and bay leaves. Reserve ½ cup beef broth, drain beef and set aside. (You may also use pressure cooker, when the whistles start blowing, time it for 30 minutes). In a pan, heat oil, saute onions and garlic until fragrant. Add in cooked beef and stir fry for a few minutes over high heat until browned. Once the beef turns brownish, pour in coconut milk, pineapple chunks with its ½ cup reserve juice, ½ cup beef broth and bagoong. Bring it to a boil and let it simmer over low heat. Add the bell pepper, bay leaves and continue to cook for 3 minutes or until sauce becomes slightly thick. Stir it from time to time to prevent scorching at the bottom. The key is low heat when cooking coconut milk. Season with patis to adjust taste. Turn off heat and transfer into a serving bowl. Serve and enjoy! Sa isang kaldero, palambutin ng 1 ½ – 2 oras ang karne ng baka sa tubig, paminta at laurel. Sa malaking kawali, Igisa ang bawang at sibuyas. Idagdag ang hiniwang karne ng baka. Kapag nagkulay brown na ang karne ay idagdag ang gata ng niyog, bagoong at pinya kasama ang juice nito. Haluin at hinaan ang apoy. Hayaan itong kumulo at kapag kumulo na ay idagdag ang bell pepper at sili. Bahagyang haluin at hayaang maluto ng 3 minuto. I-adjust po ang lasa sa pamamagitan ng patis. Patayin at isilbi kasama ang maraming kanin. Happy cooking!